Plans to divert freshwater from the Mississippi River remain controversial, especially with oyster growers. Freshwater diversions into estuaries push favorable salinities for oysters seaward, potentially beyond existing oyster reefs. 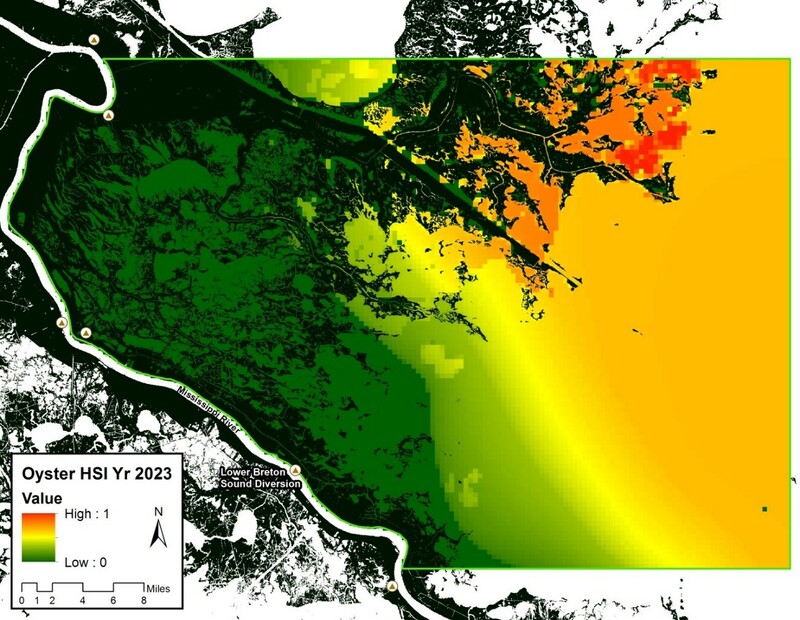 Habitat Suitability Index (HSI) models provide evaluations of the impacts of freshwater diversions to oyster habitat and GIS visualizations display optimum areas for oysters if diversions are implemented. The oyster HSI model variables are percent cover of designated area with suitable cultch (hard bottom), mean water salinity, mean salinity during the spawning season and frequency of killing floods. We maintain and continuously update our GIS representation of the distribution of private oyster leases, public grounds, and public reefs. This map, with a spatial overlay, provides an estimate percent cover of the bottom with suitable cultch. We partner with State Agencies to provide HSI visualizations of the impact of freshwater outflow on oyster habitat quality, using salinity data from monitoring stations and hydrographic models to determine mean salinity, mean salinity during the spawning season and frequency of killing floods.